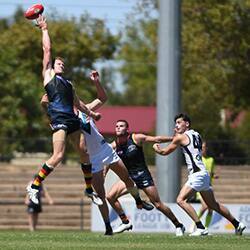 The promising ruckman continued to develop his craft in the SANFL, averaging 29 hit-outs, 13 disposals and four marks. He ranked top-10 in the League for contested marks despite missing five games with a back injury late in the season. O’Brien was also second at the Club for score involvements. He amassed 51 hit-outs and a goal in a dominant display against Norwood in Round Six. The aggressive big man will be looking to add to his two-game AFL tally in Season 2018. The developing big man proved he has what it takes to play at the highest level. 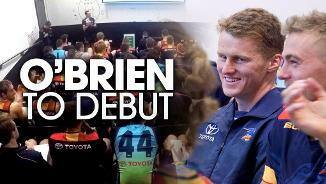 After a string of strong SANFL performances, O’Brien made his AFL debut in Round 20 against Brisbane in the absence of an injured Sam Jacobs. He amassed an impressive 29 hit-outs, 16 disposals and kicked a goal in a promising display. The competitive youngster backed it up the next week against Fremantle and again performed strongly. O’Brien then returned to the State League side and played an important role in the Club’s first ever SANFL finals campaign. Finished third in the SANFL for hit-outs (561) and second for hit-outs to advantage (181). Upgraded to the senior list for the 2017 season and re-committed to the Club until at least the end of 2019. 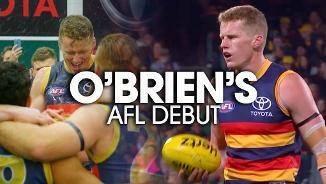 O'Brien developed into one of the leading ruckmen in the SANFL in his first year as a Crow. Carrying the SANFL Crows' No.1 ruck mantle, the 201cm youngster played 17 games, finished the season ranked fifth in the League for hit-outs, and was runner-up in Adelaide's State League Best and Fairest count. 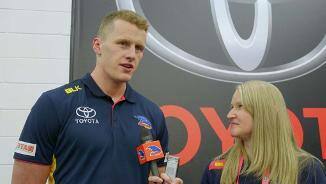 The rookie was twice promoted to Adelaide's senior list during the course of the year and came close to making his AFL debut. Signed a two-year contract extension which will see him remain at West Lakes until at least the end of 2017. 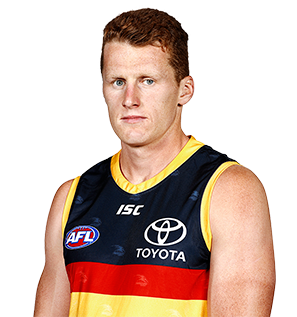 Adelaide’s first pick in the AFL Rookie Draft, O’Brien is a 201cm ruckman, who has good speed and endurance for his size. O’Brien shared the ruck duties for TAC Cup team the Calder Cannons in 2014, but has also played in defence on quality opponents including Collingwood’s top-10 father-son pick Darcy Moore. He also played two VFL games for Coburg.